The region’s buildings – half-timbered houses, Norman churches, grander abbeys and towering cathedrals – speak of the wealth which built them, The lush landscape of the interior is one of dairy herds and apple orchards where cattle graze the meadows to produce the creamy cheeses and butter for which Normandy is famous, while innumerable bees busy themselves pollinating the fruits which make cider and the Calvados (apple brandy) . The coastline is world famous. 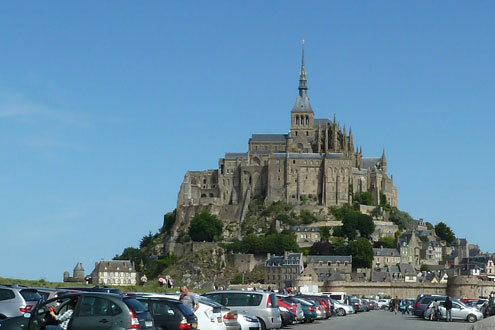 From the wide expanses of the Baie Mont St Michel with its impressive island abbey, with beaches of the Emerald coast reaching to via Cancale to the walled City of St Malo. Heading north up the rugged Cotentin Peninsula are the sweeping headlines around Arromanches and Caen, areas that witnessed the D-Day landings, when Allied troops set out to liberate France and end the Second World War. There is so much to see within easy reach of La Cahudiére. Visit the mediaval towns of Fougeres, Vitre, and Dinan. The coast offers you Granville, Cancale and St Malo and a little further afield the Bayeux tapestry, war museums at Bayeux, Caen, St-Mere-Eglise, Avranches and Cherbourg and the war cemeteries – one close to La Cahudiére at St Jame’s – one of the American war cemeteries. The Norman coast has also inspired great artistic flowering during the 19th century as chic resorts grew up along the Cote Fleurie at Deauville, Trouville and Cabourg, where Proust based his famous A la Recherche du Temps Perdu. Eugene Boudin, known for his Impressionistic seascapes, was born in historic Honfleur and Claude Monet moved there in 1864, mixing with the likes of Corot, Renoir, Pisarro and Cezanne. Inland, Giverny is one of Normandy’s most visited sites, home to Monet’s famous garden. La Cahudiére offers you a rural retreat with only a half hour drive to a range of magnificent beaches. If site seeing is your thing then there are lots of choice including the historic landing beaches. More local (10 minutes by car) is L’Ange Michel a leisure park that proves a great success with our younger visitors. The lake nearby provides opportunities for boating and fishing. Just leave a little time to sample the local produce. Restaurants and weekly farmers markets will enable to you try the delicious local produce; cider, cured meats and not to mention cheeses! Avranches, Fougeres and Rennes hold markets on a Saturday morning. All these are within an hours drive. These markets wind their way through the narrow streets giving it a wonderful atmosphere. Just down the lane from La Cahudière (10 minutes walk) is the Bridge of the Republic crossing over the Selune Lake. On the far side of the bridge is a picnic area by the water. Just turn right at the end of our lane and stroll down the hill. At the Biards bridges there is a viewing spot. (10 minutes by car) Its offers a beautiful view of the lake. It is possible to sit on the rocks by the lake. The barrage is the hydroelectric dam that has created the Selune Lake. 15 minutes by car brings you to the barrage and the picnic area by the lake. There is a parking area and toilets. La Mazure is an outdoor centre on the edge of the lake. There is a covered area by the side of the lake for picnics. In season, a small shop sells ice cream, drinks etc. There are plenty of activities here. You can hire canoes and boats to take out on the lake. In the centre of St Hilaire (15 minutes by car) is a beautiful park with two adjoining lakes. There are picnic tables here and plenty of activity equipment for children. Crazy golf is available with clubs and balls for hire from a nearby bar, a sign gives details. There is a new swimming pool in the town situated close to the Le Clerc Supermarket petrol station. It is on the road situated at the side of the petrol station. This is an open air pool which is heated and a favourite of visitors. Aqua Bay. This is a modern and well run water centre. There are two pools, one for young children and full sized adult pool. There is also a water splash tube. All these provide sandy beaches. Many have facilities for eating and drinking. Views across the Bay of Mt St Michel and the Mount itself. There are free car parks Horse & Pony riding is available or for the daring, a guided tour across the sand flats. Alternatively, having taken the second left turn towards Jullouville you can follow the signs for the route of the bay and discover the coastline yourself. Places of interest might be: Le Grouin du Sud, St Leonard and Le Grand Port. If you head further west you will discover more beaches as you head towards Cancale and St Malo. Look out for Port St Mer – a beautiful cove with some good restaurants and activities for children during the summer. About an one hour drive along the cost from La Cahudiére.